Update 10/28/2016 - Latest OCTGN auto update adds AWAKENING to the patch. Make sure to download the latest image pack from the download section to add card images. Maintaining the OCTGN DBZ TCG Patch requires a great deal of maintenance, coordination, and support; in addition to hosting for the image packs. Please consider a donation if you enjoy playing the Dragon Ball Z TCG on OCTGN. Any amount is appreciated! What is OCTGN? OCTGN is a virtual table top with an integrated player lobby and chat system that supports custom card and board games. The DBZ Game Definition lets players play their favorite Dragon Ball Z Card Game on there!! After the game feed is installed, click the drop box to the left of "Add Game Feed" and select "DBZ Feed". From there, you have the option to install or uninstall the game. To add images, you have to download each image pack. First, download each file. Then, extract the zip files. To add the images in-game, click "Add Image Packs" and select the .o8c file(s) that was extracted from the zip. 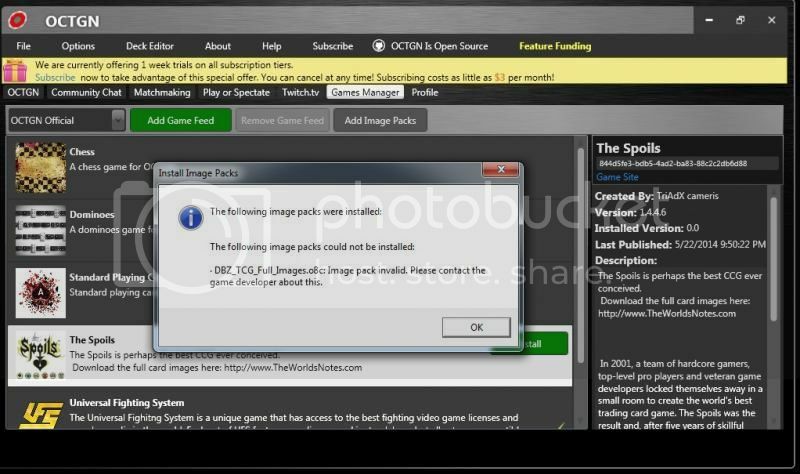 After installing the image pack(s), you should get a success prompt. That's it! You're all set to play DBZ online via OCTGN. Enjoy the many benefits OCTGN has to offer, like game rooms, matchmaking, etc. Reaction Buttons appear when you load a deck. Clicking them announces either a Pass, no further actions, or a wait; wants to react. Alternatively, CTRL+Spacebar announces a pass. F5-F9 jump through phases. Ctrl+Enter moves to next phase. After last phase turn will switch to the other player. Although the declare combat phase isn't a real phase in the game, this is what players should use to declare a combat step and to do "When Entering Combat", as this will make sure players do not miss declaring a combat. I can't wait until I get home from work tonight to start deck building and playing. Most of the promo cards haven't been revealed yet, so those are missing. Nevermind, I figured it out, thank you sir! I've got a game up with no p-word. Someone join! Has anyone successfully downloaded octgn onto a Mac OS? Alrighty, so I've never played using OCTGN before. Is there a how to guide somewhere that outlines how to start a game and the basic/most used functions while playing? Any help would be awesome. Thanks. Well an update is about to go live in the next hour that adds phases and reaction buttons to the game. I feel like this will make OCTGN 100 times more bearable to play online for the new DBZ TCG! Z-Scouter is now added into the game. Says error try restarting when going to deck editor. Any tips? I think you broked it jarrett, nothing is working after the update. I did delete and reinstall. Several users are saying they can't play that I talked to. Will try again tomorrow, looking forward to getiing some games in. Has anyone figured out how go get the Deck Editor to work yet? I've tried reinstalling a few times with no results. It still says there was an error. It's an error on my part. For now, I'd just use the website deck builder. I'm actually in the middle of fixing the error, and I think I found the culprit. Should be updated in the next hour. Patch should be fixed. Auto-update will fix the issue. Thanks! the image file keeps cutting off before it's done, is the download avable anywhere else? For some reason whenever I look at my deck or someone else's deck, the cards are not showing up. Only the backs of the cards is showing. Whenever I hover over a card in my deck however, the correct image will pop up. Does anyone know why this might be happening? Mike2: Reinstall the image pack addon. Link is above. so i have it all installed. every time hit play i cant seem to get into any game its just a chat. how do i get to deck building or play testing do i need someone else to be there?